Formed by a bond of brotherhood between Brian Taing (founder of the Workshop Brothers brand), Thomas Ho, Jason Ngo and Hung Huynh and inspired by their love for street art and hip-hop culture, Homi offers a modern take on Vietnamese classics that everyone can love. 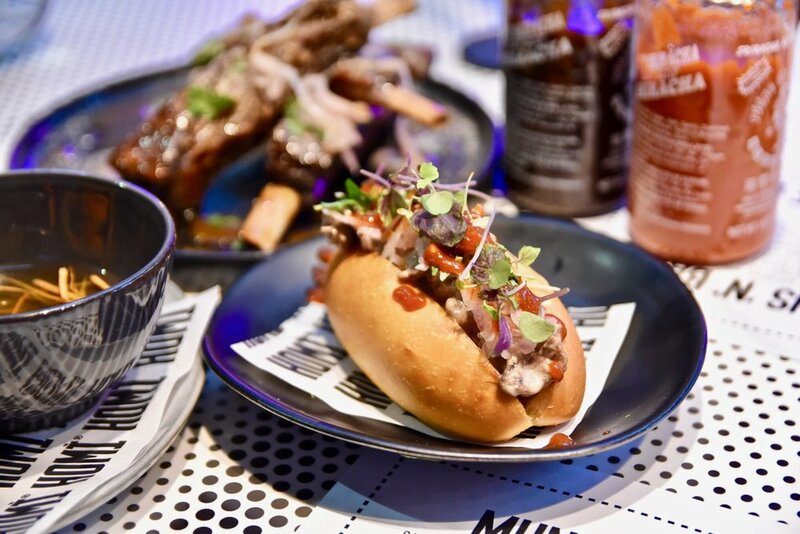 From bao burgers, chicken wings and salted coconut iced coffee, to Crab Banh Canh, spring rolls and pho with a twist, the menu is perfect for sharing. To start we recommend the caramel ribs. Tender, falling off the bone, juicy and packed with flavour. Simply yum! From the "buns n' bao" section, the pho' wich is both interesting and absolutely moreish. Think tender beef cooked in intense pho broth garnished with Vietnamese mint, pickled shallot, 5 spice and spicy hoisin sandwiched between a buttery brioche roll. Noodles are the main affair here, so make sure you get yourself a bowl. The soft shell crab banh canh is our top pick. Slippery rice drop noodles swimming in a thick broth topped with perfectly cooked soft shell crab. It's comfort food at its best. Dessert time continues to please at Homi. Try the Ferrero bao. You can thank us later.